A friendly, family-run hotel located in Saint George Beach, about 30 metres from the sea and only a 2 minute walk from Naxos town centre. 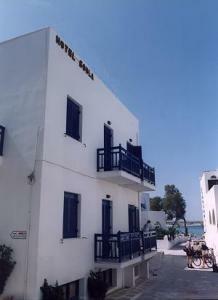 Soula is a small hotel with 22 comfortable and bright rooms with a balcony and daily cleaning service. For your convenience and a hassle-free holiday experience, the hotel offers free transfers to and from the port and airport. Make use of a parking area, free ADSL internet access, free wireless internet access, and a TV lounge. Ensure you visit the island's highlights, with help from the free map, and excursions and car rental services available via reception. 24-hour Front Desk, Terrace, Family Rooms, Express Check-in/Check-out, Safety Deposit Box, Heating, Luggage Storage, Gay Friendly. Airport Shuttle, Laundry, Ironing Service, Internet Services, Currency Exchange, Bicycle Rent, Car Rental, Tour Desk, Fax/Photocopying, Wi-Fi / Wireless LAN, Free Wi-Fi Internet Access Included. Beach, City Centre, Shopping Centre.